Watch the Amsterdam Light Festival from the water in one of our luxury saloon boats. During a canal cruise of about 1.5 hours you can enjoy all the light artworks while enjoying a drink and a snack. 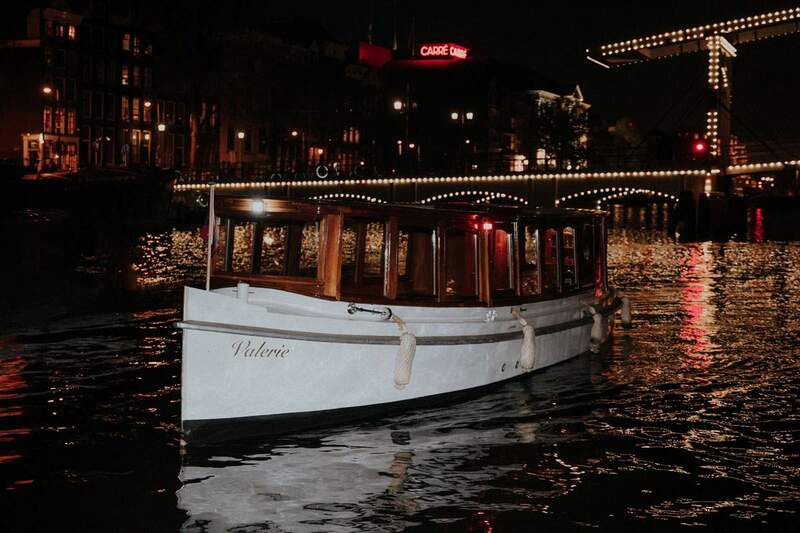 Saloon boat Valerie is one of the luxury saloon boats which Amsterdam Boothuur will use to guide you by boat past the light artworks of Amsterdam Light Festival. Please specify with how many persons you want to have the Amsterdam Light Festival canal cruise. Minimum 1, maximum 20. The costs are € 260,- plus € 12.50 per person. Mentioned prices include € 5.75 remittance per person for the Amsterdam Light Festival and € 0.66 city tax. designers and architects light up the inner city of Amsterdam. Once again Amsterdam Boothuur will guide you by boat along the artworks. Every year the festival throws a new light on the city. This year the artists were inspired by the theme ‘The Medium is the Message’. The idea behind this famous quote by Canadian scientist Marshall McLuhan was simple: not only the message in itself is important, but also the way we send it out. Light as a message plays an important role in various ways. During Amsterdam Light Festival, Amsterdam Boattour will take you along all the artworks in a luxury saloon boat. Would you like to know more about the saloon boats or use a saloon boat for another occasion? Read more on our page about the saloon boats. Experience the atmosphere of Amsterdam Light Festival with the after-movie of edition 2017-2018. The default boarding location is at the pier in front of Royal Theatre Carre (address Amstel 115, 1018 EM Amsterdam). It is possible to discuss another boarding location, depending on busyness. There are several parking garages around Carré Theater and you can also park in the street near Carre Theater. We had a wonderful cruise, a great skipper and lovely boat. Very customer friendly and service oriented! A beautiful, representative boat, especially compared to other providers. Highly recommended for a successful event / outing. The whole party has enjoyed it. We will certainly do this again in the future. Boat rented for bachelor party, well arranged, boat was on time, route in consultation, drinking was cold and sufficient on board.